All the way back in 2001 we visited Florence with our friends Joe & Missy. Erynn and I were living in England at the time so it was easy to meet up with them during their trip. We flew in and out of Rome and took the train to Florence. On the way back we had a few hours in Rome before our plane left so we hit the Colosseum and Vatican City. Certainly a nice add-on for the trip, but we didn't do the city justice. 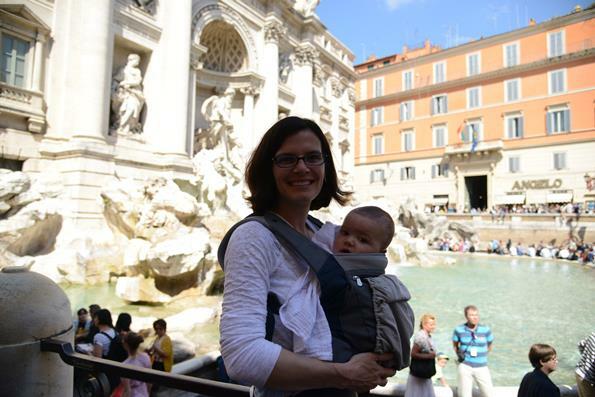 Now that we live in Germany we decided to hop back to Rome for a more extended stay. This time a long 4-day weekend with our kids. Going back was always on the top of Erynn's list after our previous short stopover, and we had a great time. We went in April so the weather was really nice since going more toward the summer it can get quite hot. 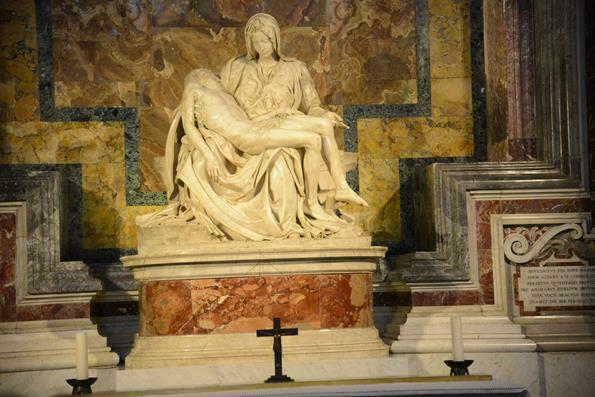 For full resolution photos from the trip to Rome click here. 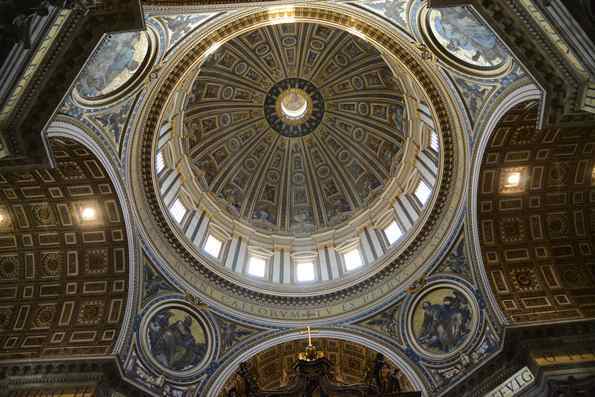 Erynn found a great 3-bedroom place on AirBnB in the Prati neighborhood. 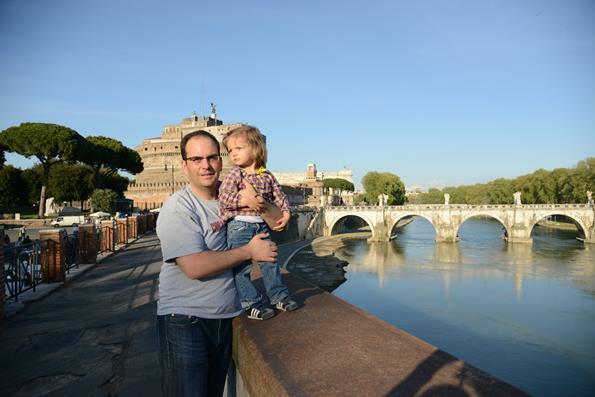 The location was perfect and we could easily walk to everything except the Coloseum area. 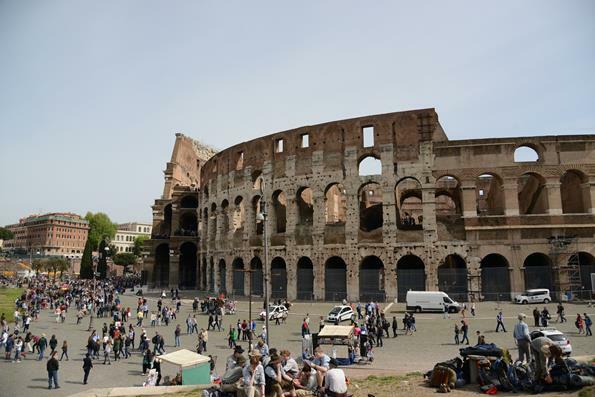 But the subway was only a couple blocks away making it easy to get to the Colosseum too. The best part of the apartment was the old style elevator! 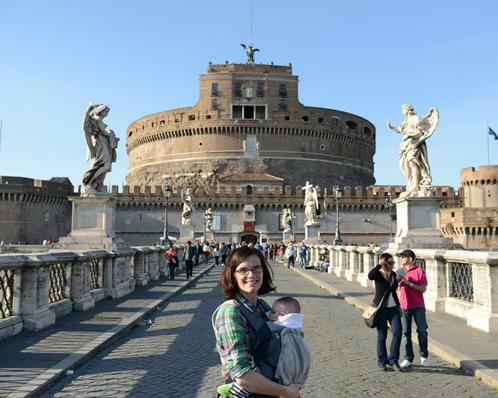 After our arrival and settling into the apartment we took a leisurely walk near our apartment to the area around the Castelo Sant'Angelo. 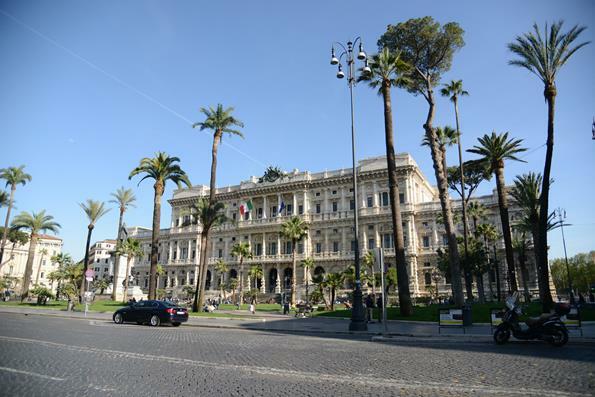 Along the way to the castle was the Palazzo di Giustizia (Palace of Justice) and in front the Piazza Camillo Cavour. 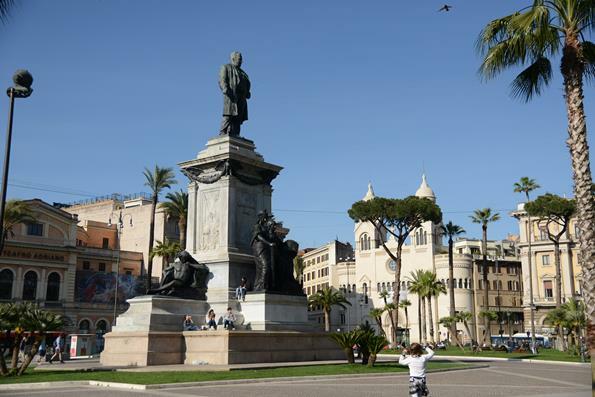 The area around the Castelo Sant'Angelo is very picturesque. Especially in the afternoon sun. 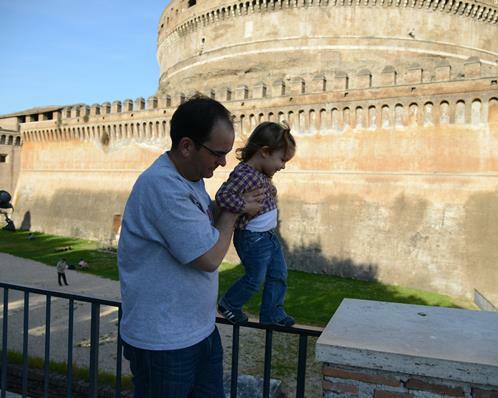 The castle has a commanding position over the city and River Tiber. 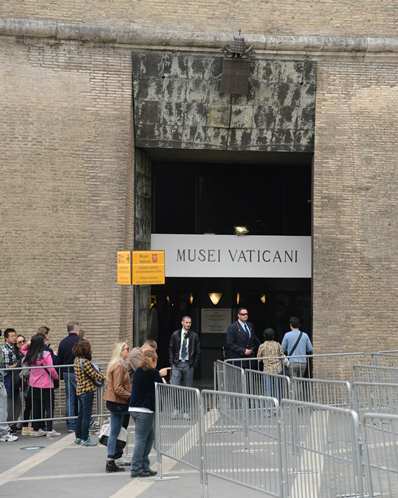 Today it is a museum, but in the past was used as a mausoleum and fortress for Popes. It was just a lovely afternoon and we let Greta play in the gardens next to the castle to help burn off some energy. A final shot of the Castelo Sant'Angelo with the Ponte Vittorio Emanuelle II (bridge) in the foreground. 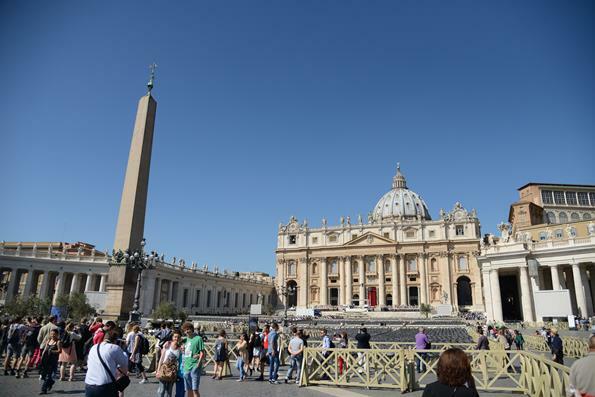 On our first full day in the city we decided to start out with the Vatican. It was a Friday (presumably work day), but just before Palm Sunday (you can see the chairs set up for Holy Week). 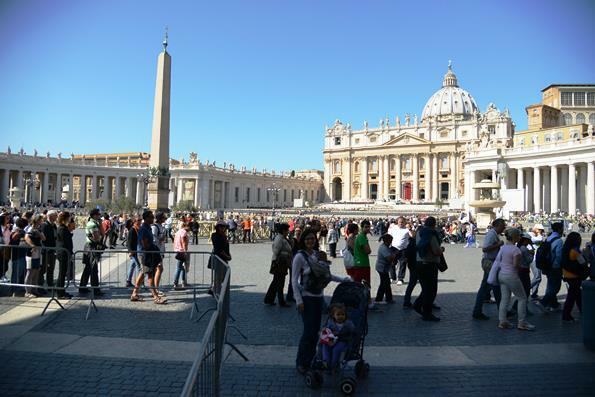 When we arrived the line to get into St. Peter's Basilica stretched all the way around St. Peter's Square. We guess a multi-hour wait. So we gave it a pass for the morning and continued on with our day's adventure. 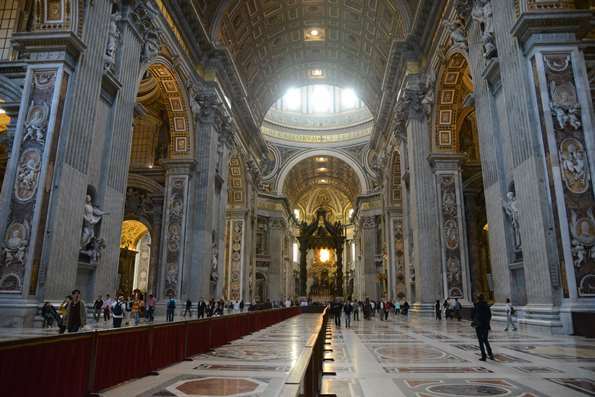 At the end of the day we did make it back to St. Peter's and the line was very short to get inside where we took some cool photos. Before neon lights, this place was most likely the definition of over-the-top bling. 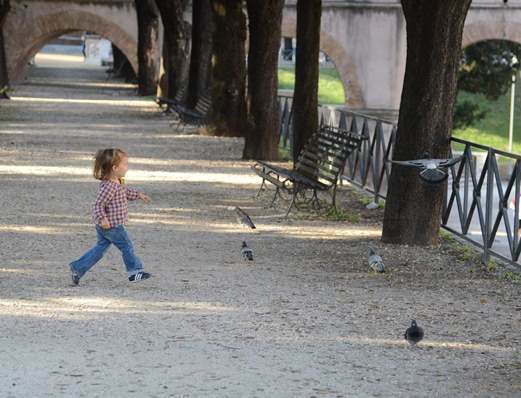 Greta was not quite three at the time of the trip. She is addicted to the iPad and when things get a bit rough it is our go-to device for some calm. 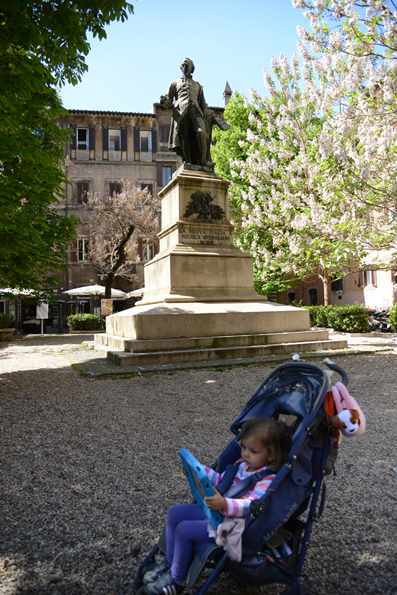 The downside of course is that she misses things like the Piazza San Cesarini, a nice little park along the Corso Vittorio Emanuele II. Although JB had a good time getting out of his harness for a few minutes! 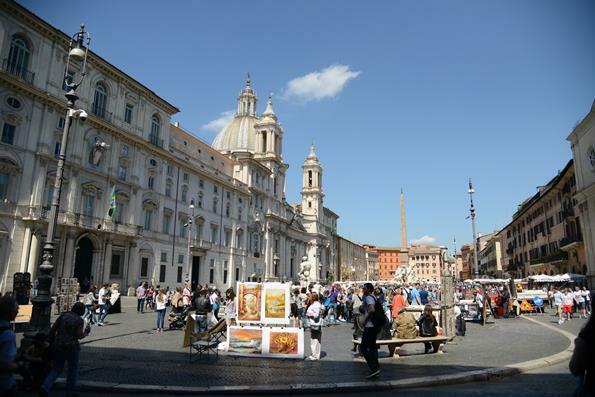 The next stop on our walking tour was the Piazza Navona, which nowadays appears to be just a huge tourist bazaar. The whole place was filled with people selling stuff and street performers. 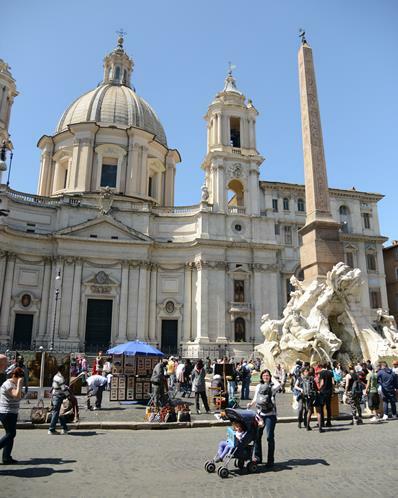 However, through the masses of people it is possible to glimpse some nice fountains and an imposing church. 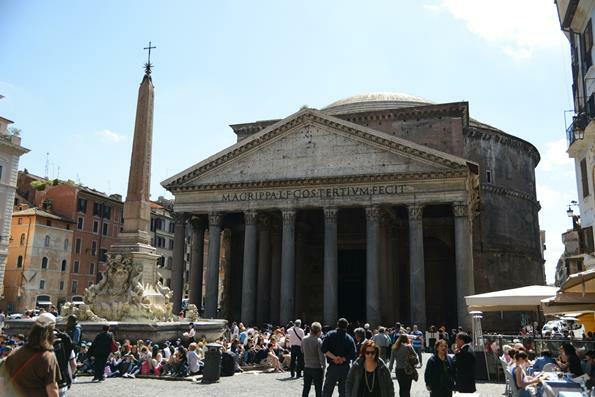 Next up was the Piazza della Rotonda and the Pantheon. 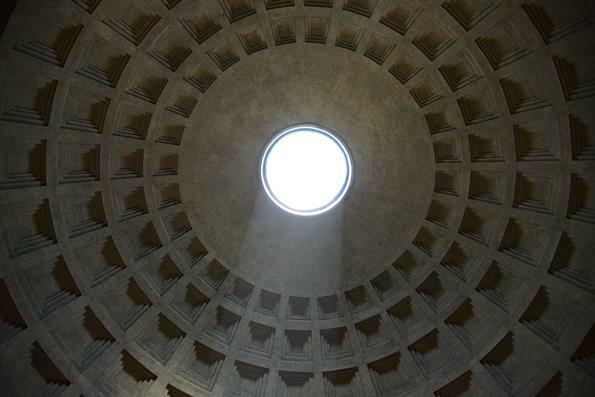 The Pantheon was built in 126 AD with a dome 142 feet high made out of Roman concrete. 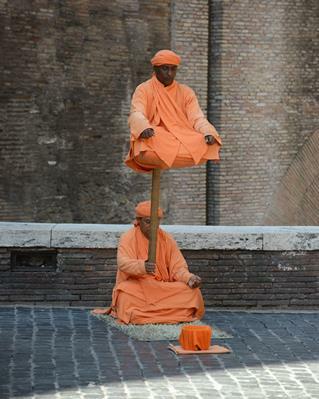 In almost every square there were these guys that had a setup that looked like they were levitating. Hey, anything to make a buck. 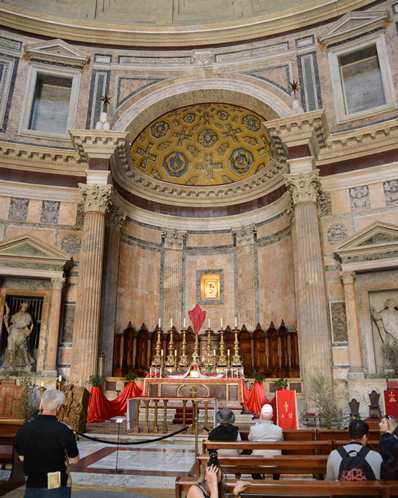 The Pantheon has been in continuous use for its entire history. 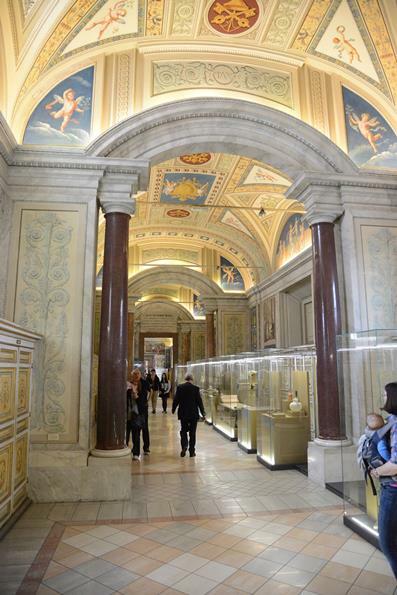 It is now part church, part museum and completely a tourist destination. 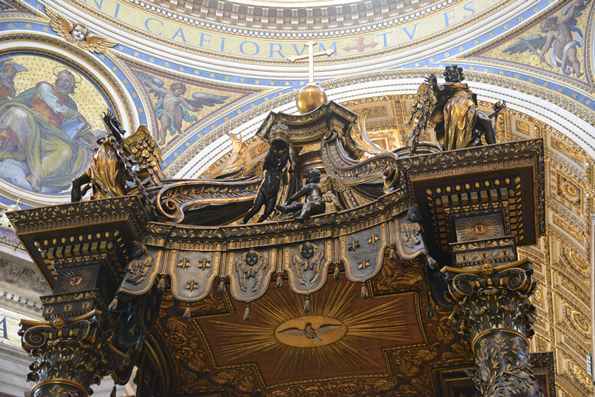 In these pictures you can see the altar and the Oculus (hole in the dome) with a beam of light shining through. 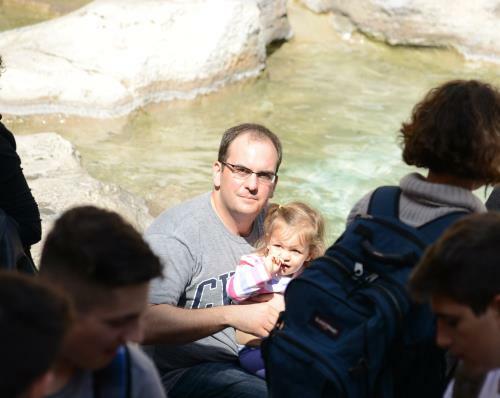 Our last stop before heading back to the Vatican was the Trevi Fountain. The square was thronged with people. 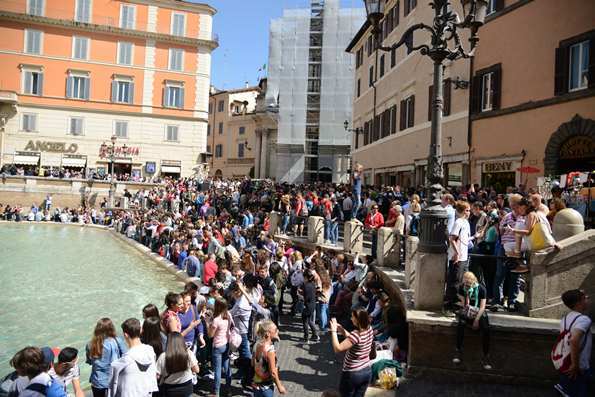 It was incredible - both the fountain and the people watching. 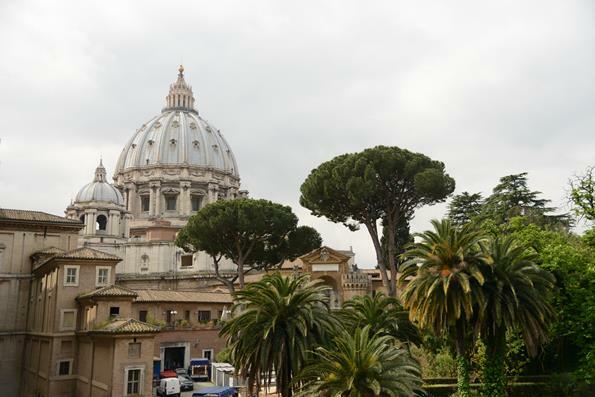 On our second full day we decided to visit the Vatican Museum. We got around as soon as our small children would allow, but by then the line to get in was already over one kilometer long! This was a "must do" for the trip so we shrugged our shoulders and joined the back of the line. 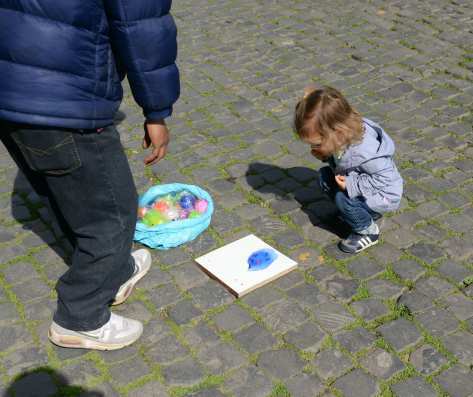 Of course, wherever there are tourists in Rome there is an opportunity to sell something. So there were a bunch of buskers walking up and down the line trying to sell "tours" to people with the promise of skipping the line. 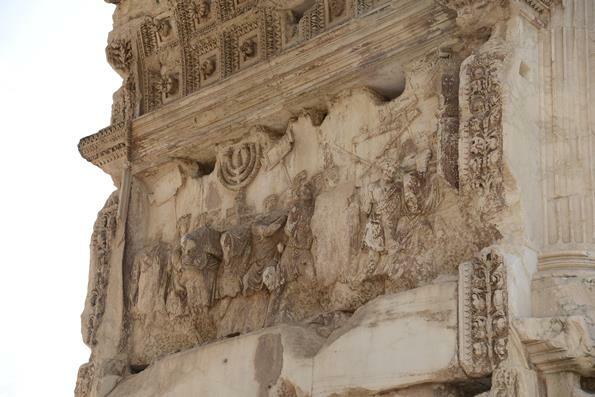 The left photo is the section of line by the entrance. 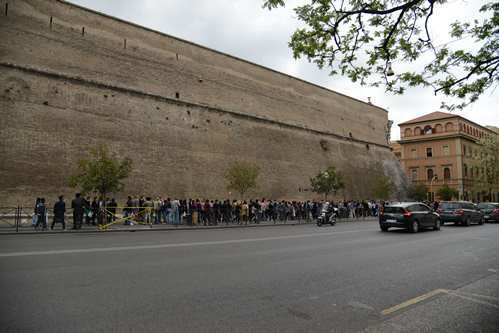 The right photo shows the line wrapped around the block. The line was this long all day. Insane. Tourists can be a pretty jaded bunch, including us, so no one was taking the buskers up on their offer to skip the line and join a tour. A few of the sales people mentioned to us that with kids we didn't need to wait in line. Like the fourth person to mention it was a nice sales lady and she said she was sincere that we could go to the front of the line with such small children. Knowing the alternative was an hours long wait we decided to walk up to the front and test our luck. If it didn't work out then we would face an hours long wait anyway. So why not? 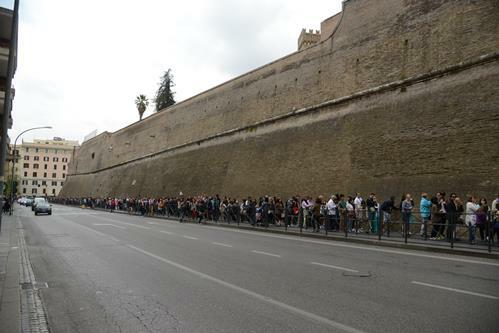 In the left hand side of this photo you can see the very end of the kilometer long line waiting to get in. The empty guard rails on the right were for the tour groups. If a tour group came they stopped the main line. 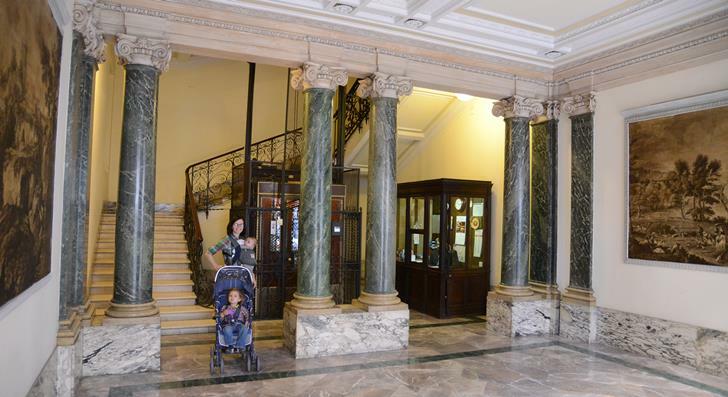 For us with our two small children the security guards did, in fact, let us go right in! So the word of advice is join a tour (split off from them if you're not interested) or bring your small kids. 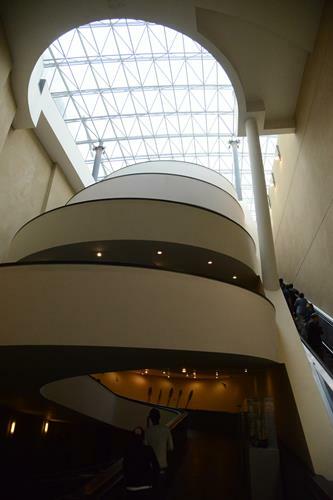 The Vatican Museum itself is pretty amazing. 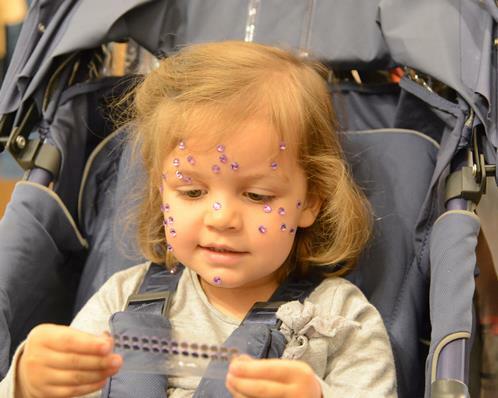 We passed through much of the exhibits relatively quickly to get a general feel. 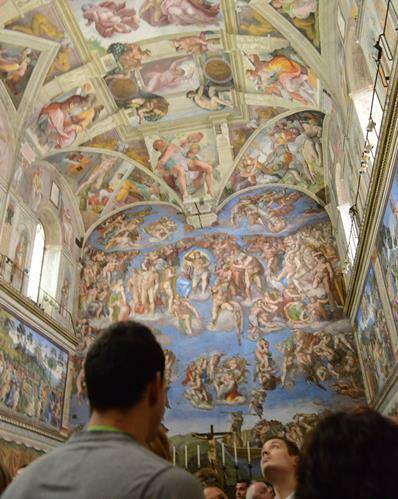 The place is huge and we wanted to hit the Sistine Chapel at some point before the kids melted down. 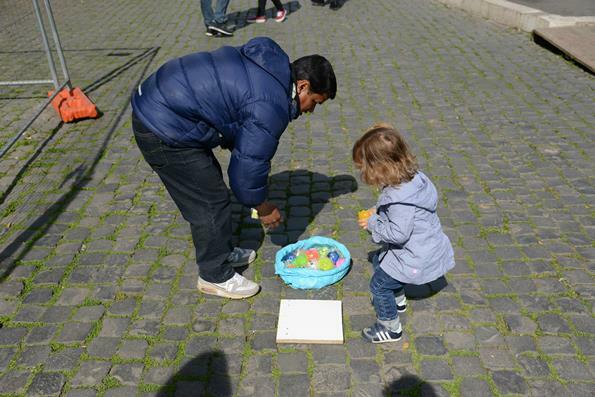 So it was a delicate balance of the adults enjoying the stuff vs. being quick enough to see it all. 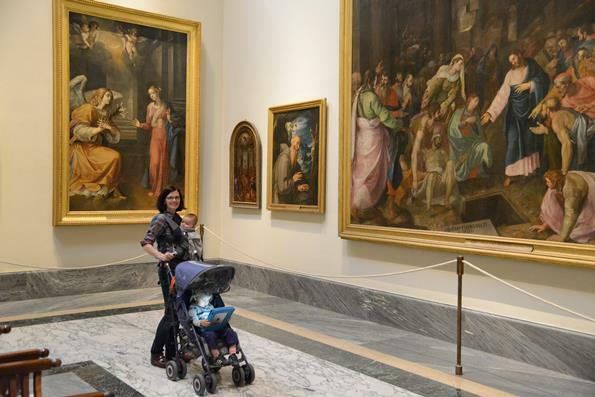 But I imagine if you have the time you could easily spend all day looking at wonderful art. 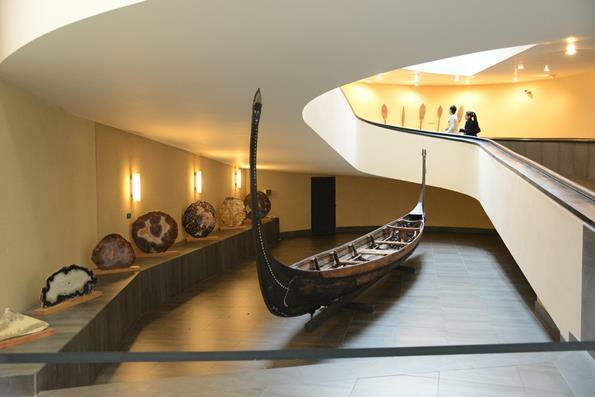 The museum was spread out over numerous buildings with many courtyards and many of the windows were open. The result was a meandering walk with nice scenery interspersed with priceless art. Really quite nice. 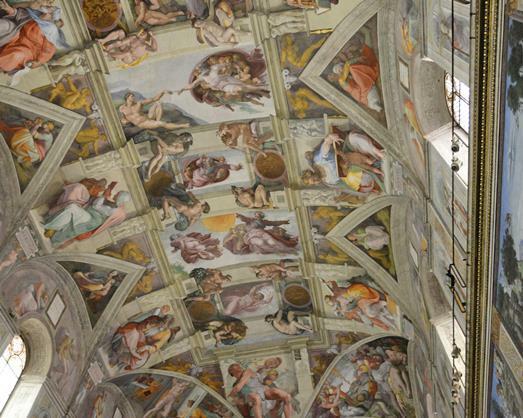 With our small kids we were able to bypass a chunk of the tour and take a short cut to the Sistine Chapel. We were able to go down the long hallway in the left photo, which is normally the passage as people exit the chapel. 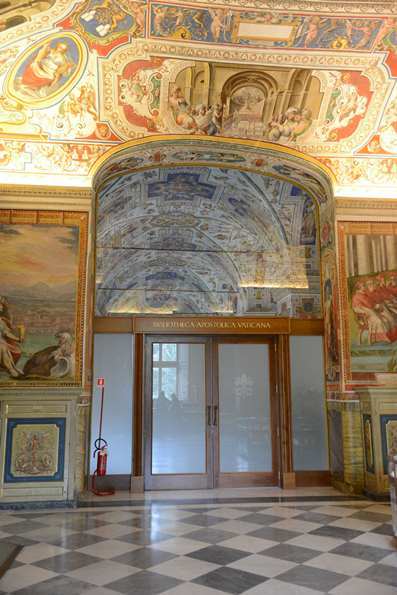 We even passed the entrance to the Vatican Library, but alas, Dan Brown was nowhere to be seen. 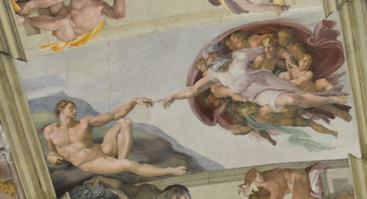 As I just mentioned we entered the Sistine Chapel through the exit. As a result we didn't see any of the warnings about not taking photos inside, and pictures were generally allowed in the rest of the museum. So what did I do? I broke out the wide angle lens and happily snapped some incredible photos of the Last Judgement and ceiling by Michelangelo. Really great photos. Then an employee came up to me and started berating me about taking photos and made me delete them all. He watched me delete them on the camera. I didn't use a flash, but with nice enough gear the photos can still be spectacular. But never mind, usually when pictures aren't allowed it's due to the fact they want you to buy pictures from the gift shop. Not necessarily to avoid damage to the work. 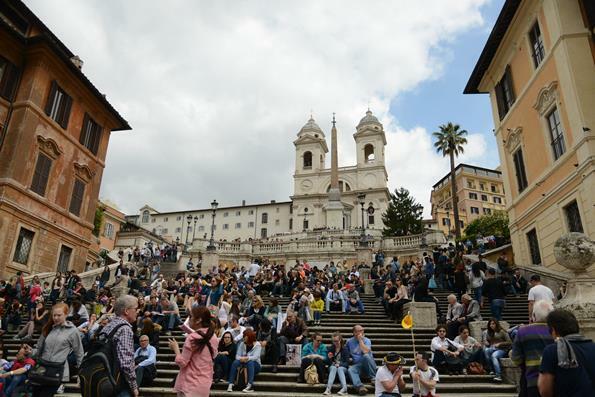 After the Vatican Museum we headed to the Spanish Steps and the Tridente area for some shopping. 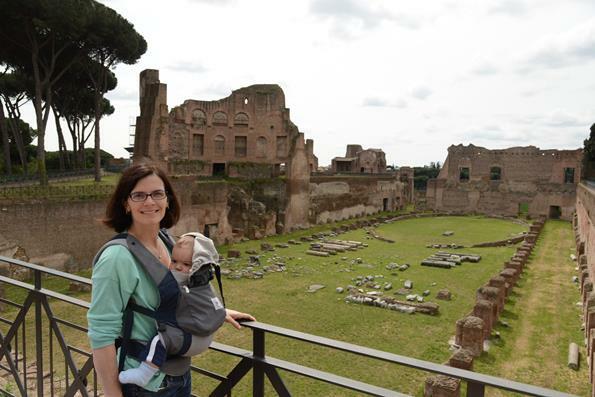 On our last day in the city we walked around Ancient Rome. 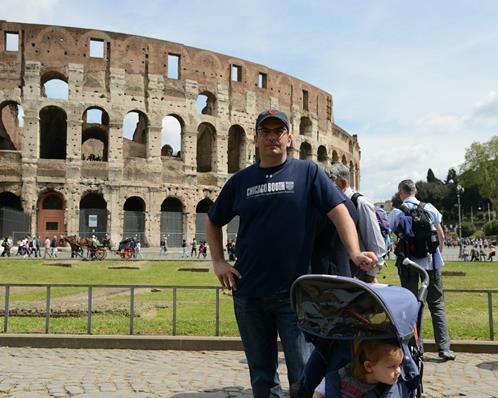 As I mentioned, on our previous visit we went into the Colosseum, but on this day the line was incredible so we gave it a pass. Plus with a stroller and kids that wouldn't remember it anyway, we knew we had a good plan to skip. 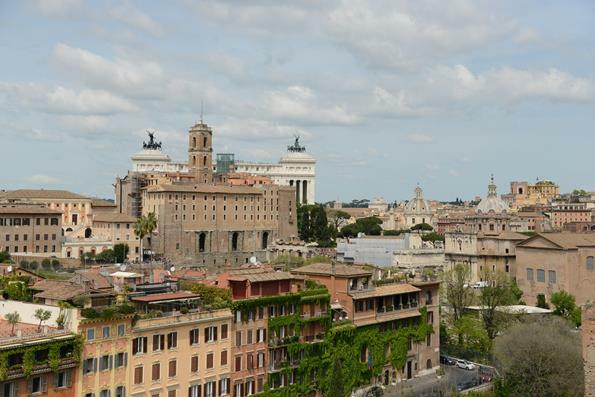 Not far from the Colosseum is the Palatino Hill and Roman Forum. 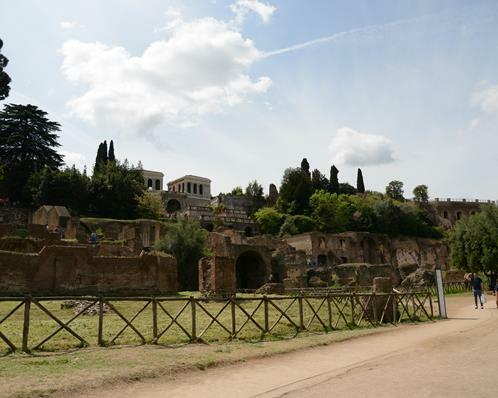 The Palatino Hill is where all of the rich and royal people lived. Walking around the hill you see some impressive ruins and some nice views of the city. 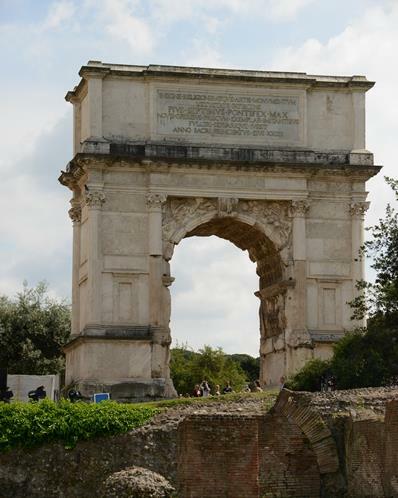 Down into the Roman Forum you're greeted by the Arch of Titus to commemorate Titus' victories, including the sacking of Jerusalem. 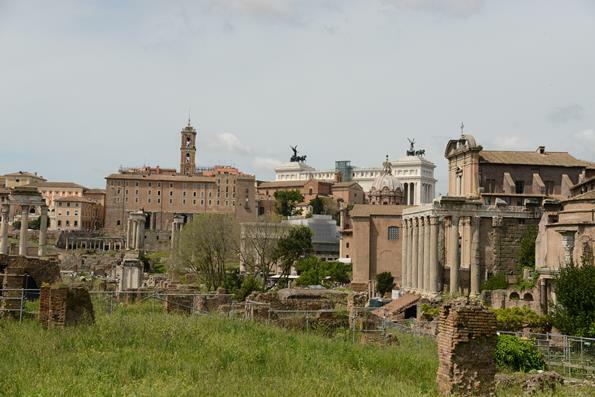 And some photos from the Roman Forum itself. It was a pretty long weekend, and we were tired. 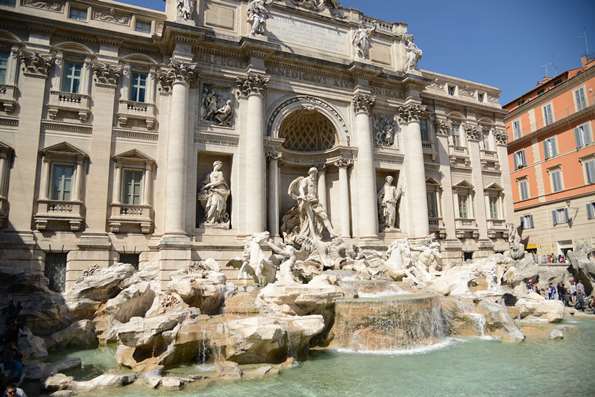 Therefore, we didn't explore the Forum in detail and headed home for a nice dinner and relaxing evening before heading home the next morning. 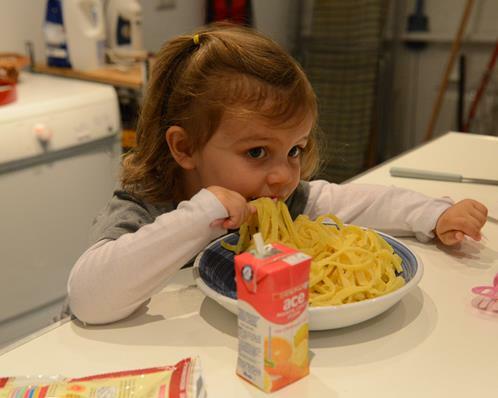 Our little Greta had pasta for dinner each night of the trip. There was a little grocery store nearby and fixed dinner for ourselves. It really is amazing the quality of food in Italy. Just simple pre-packaged stuff out of a store tastes so much better than anything you can get anywhere else. Yummy! 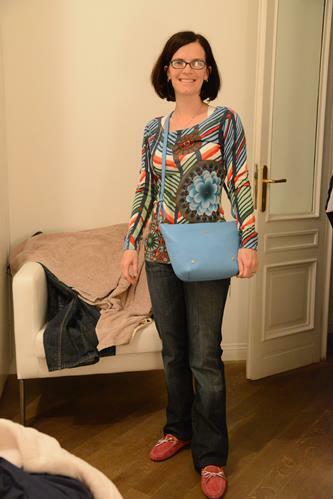 Lastly, here is a photo of Erynn showing off her completely new ensemble from Rome. Oh là là!